One of the perks of being a former teacher (and Facebook) is catching up with former students and seeing "how they turned out". Had the pleasure of seeing a former field commander from the 80's, Laurie Hughes, while we were in SW Ohio. Today, we had the honor of meeting with a former student who's currently serving in the military, 1LT. Eric Cornelius. Eric flew into the Nashville Airport on an Army Helo and let us see the bird. Fascinating. It was amazing to us how these Vietnam era choppers have been refurbed and retrofitted to serve in today's Army and this era of modern warfare. Great experience. We found a boat ramp about a mile from where we're staying. Looking forward to adding the Cumberland River to the bodies of water the raft has travelled. 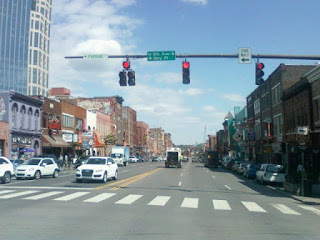 Made our initial trip into downtown Nashville. Beautiful, clean downtown. Loved "the District" on Broadway. Tons of live music, eateries, pubs. 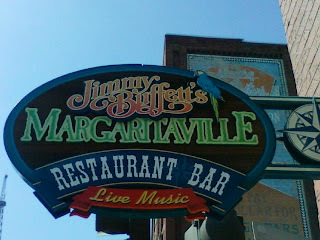 We checked off the Margaritaville in Nashville with a great lunch. Have hit the ones in Key West, Orlando, Las Vegas, Waikiki, New Orleans, Cancun, Ocho Rios, Gran Turk, and Grand Cayman. Still a few left to do, as he keeps opening new ones. After lunch, we rounded the corner and took a photo of the Ryman Auditorium (former home of the Grand Ole Opry). 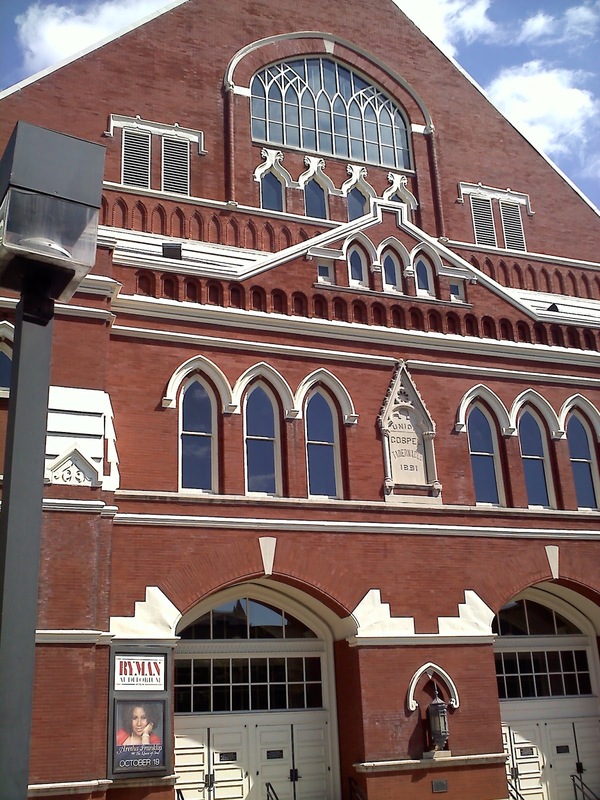 Tours are available and there is still live entertainment on certain nights. The area was full of activity for a Wednesday afternoon! After a day on the road yesterday, we made a pretty seamless set up here at Two Rivers Campground in Nashville. Pretty much hit us today, that it was a return to normalcy. Just the two of us (and Sloopy) with a full day of work. No entertaining to do. No schedules to fit in. No people to meet or places to go. Had an unbelievable rain last night, but weather rebounded today. We were starting to notice the coolness setting in to Southwest Ohio, and started realizing it wasn't only the winters that would get us down. Our time here in our hometown (Wilmington, OH) is winding down. Tonight is the Homecoming game and annual Chili Supper. It has been almost 30 years since we last attended this event. We are looking forward to seeing some of our high school friends! While we have been enjoying our time with family and friends, the weather is reminding us why we chose the full-time RV lifestyle. There is a chill in the air and the rainy season seems to be upon us. We are ready to begin our journey south on Sunday in search of warmer, dryer weather. Have a great weekend everyone. Go 'Canes! It always amazes me the parks that won't let you wash your rig, especially those that offer monthly/seasonal rates. 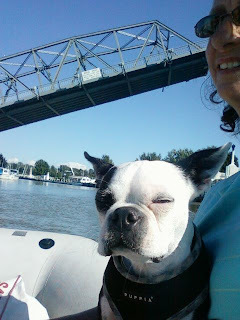 As a former boater, black streaks drive us crazy. So, after a particularly rainy week last week, we had a ton of black streaks. Fortunately, the park we're staying (Cardinal Camping Center) doesn't have anything in the rules about washing your rig. It's the old saying "better to ask forgiveness than permission" time. We know there's extra expense in people washing their RV's, but honestly, wouldn't it look better upon your park to have shiny RV's in there than black streaky, nasty ones? Entering a stretch in our schedule where we're hitting Central Ohio then Southwest Ohio (the I-71 tour?) in consecutive weeks before going to Nashville for a month. Most people think fulltime RV'ers spend every day on the road. Yikes, that would be awful! We looked at our calendar and we'll actually "travel" 23 days this year. We lived in one town (Wilmington, OH) from birth to college at Ohio State. Our first house together was in one town (Jamestown, OH) for four years, then off to a second town (Washington C.H., OH) for 6 years. In 1993, we moved to Ashtabula, Ohio and stayed there until we started full timing last December, 2010. It was a great 17 years. We met so many great friends, co-workers, club members, that it's hard not to say this is our "hometown". It's a question we get asked all the time, "where are you from?" Ohio is the best answer, but Ashtabula will always hold a special place in our hearts for the people and opportunities we had here. Sloopy is our Boston Terrier. Almost five years ago, we lost our "JoBu" and decided time had come to start thinking about our fulltime future. Narrowed down our breeds to a Boston Terrier and a Boxer with the Beastie winning because of their size. Didn't want shedding, barking, and wanted a dog that would be a good "apartment dog". 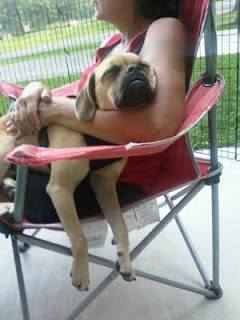 With the wedding, we offered to keep Tucker, our daughter and son in law's Puggle. He's 8 months old, all boy, and a lovable little guy. But we realized early we would need to really ramp up his exercise in order for him to be balanced. We've enjoyed having "the boy", but he's been a handful. Finally starting to get him into a regimine, but it's been a challenge. So, if you're thinking about full timing, think about your pet. Not fair to the dog to get a breed that won't easily adapt to the lifestyle. But "our house" wouldn't be "a home" without a dog.